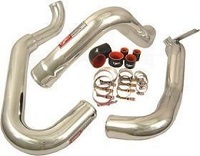 Injen Intercooler Piping Kits are the new standard on high performance turbocharged vehicles. Utilizing T6 60601 Aluminum you can be sure your turbocharged motor will be breathing the coolest and most consistent air. Bolt on kits include all necessary hoses and couplers for easy installation!